A confederacy of prison reform activists rallied at City Hall in New York City to demand that it close the long-controversial Rikers Island Corrections facility where, among others, Kalief Browder, died; critics maintain that the prison is unsafe and prolonged detention of inmates at the facility is a violation of Constitutional due process rights. "Kids are literally dying because of the policy we have today," Cuomo told the assembled crowd. "These are poor people who are members of minority groups who have long histories of being discriminated against." The audience cheered Cuomo at the event for "raising the age" — that is, changing state laws so that 16- and 17-year-old offenders are sent into the juvenile justice system instead of trying them and imprisoning them as adults. Marc Schindler, the executive director of the Justice Policy Institute, a nonpartisan think tank in Washington D.C, put these policies in explicit racial terms. "If these policies were disproportionately impacting middle and upper class white kids, these policies wouldn't be allowed to exist," he said. So why didn't juvenile courts and jails become overwhelmed with new cases? The researchers pointed to a broader ongoing decline in crime over the last decade, and said that opponents of raising the age were often stakeholders invested in the current system, like corrections' officers unions and prosecutors, who the researchers say overestimated the costs of trying and incarcerating young offenders. (Repeated calls to the corrections officers union in New York went unreturned.) The researchers said that states that raised the age also spent more resources on alternatives to incarceration, like probation and outpatient rehabilitation. "I think while there's a lot of work that we need to do in juvenile systems around the country, at least those systems are making an attempt to do rehabilitative service," Schindler said. The researchers found similar results in Illinois and Massachusetts, and found that the declines in juvenile arrests in those states outpaced the declines in the rest of the country. The politics of raising the age in New York State are complicated: both liberals and conservatives broadly support raising the age in principle, but express specific concerns about the proposal put forward by the governor. Advocates for reform say that proposals have left many harsh penalties in place for teenagers as young as 13 arrested for certain violent crimes. Lawmakers worry about where juvenile offenders would be housed to serve their sentences. Prosecutors expressed concern that the raise-the-age legislation proposed by the governor would take away their discretion in assigning cases to different courts and increase the number of sealed records, making it harder to identify repeat offenders. Elias Husamudeen, the president of the Corrections Officers Benevolent Association of New York, said that his union is not opposed to raising the age because relatively few inmates in jails like Rikers are under 18. In 2015, there were about 1,200 inmates at Rikers ages 18-21 out of a total population of about 10,000. "If you want to not treat them as adults, fine," Husamudeen said. "But is that going to do anything to reduce the crimes we find this particular age group involved in?" Husamudeen also said that raising the age might make young people more likely to be recruited by gangs to commit crimes, since they would face comparatively light punishment. Proponents for raising the age have cited the growing body of research that strongly suggests that the brains of 16- and 17-year-olds are not done developing — and that young people may not have the same capacity to control their impulses or understand the consequences of their behavior. (Some studies show that young people placed into adult prisons are more likely to re-offend.) Schindler said that trying juveniles as adults stacks the deck against them; with adult criminal records, they face steep hurdles to employment and education. Schindler pointed to the most infamous recent case of the dangers of placing young people in adult detention. 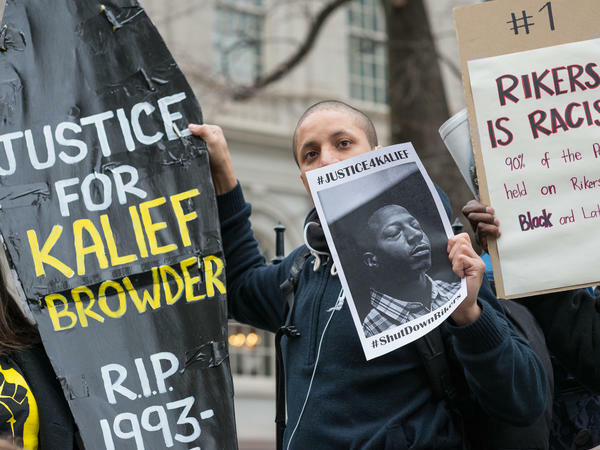 Kalief Browder was arrested in 2010 at the age 16 for allegedly stealing a backpack, and although he was never charged, Browder spent three years on Rikers Island, mostly in solitary confinement. After his release in 2015, Browder committed suicide. "That's an example for everyone," Schindler said. "If that doesn't get our attention, what will?"